Using Vintage Kilims for Furniture. I have several clients who like the look of well-loved, vibrantly muted, geometric kilims. I like them, too. Sometimes people use them on the floor as rugs, as they were originally intended to be used. Sometimes people hang them on the wall; a technique that is great for stairway walls, because they can take up a vast amount of what is usually awkward space without overwhelming a room. But most of the time, I hunt down ottomans that have been upholstered in vintage kilims and we use them as soft coffee tables. You can definitely have your upholsterer make one of these for you, or, you can find scores of them (often at great prices) at retailers like West Elm, One Kings Lane, or Anthropologie. 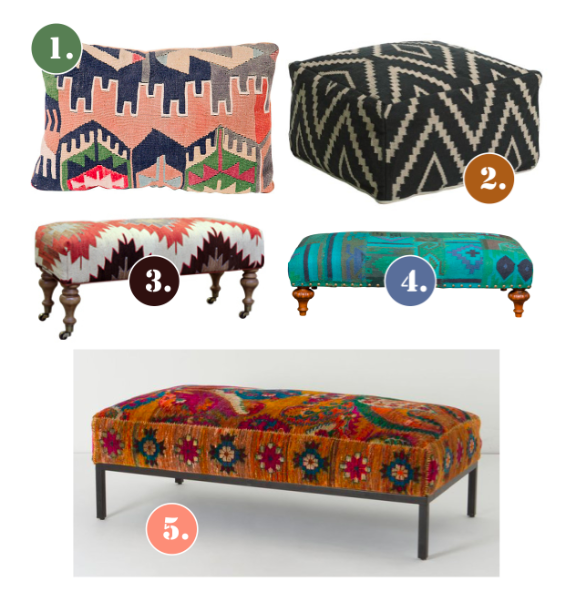 Here are five great pieces – from pillows to poufs – all upholstered in vintage, authentic, kilims. Enjoy and follow through with the links if you’re interested in purchasing them – that one-of-a-kind One Kings Lane pillow (#1) isn’t going to last long!